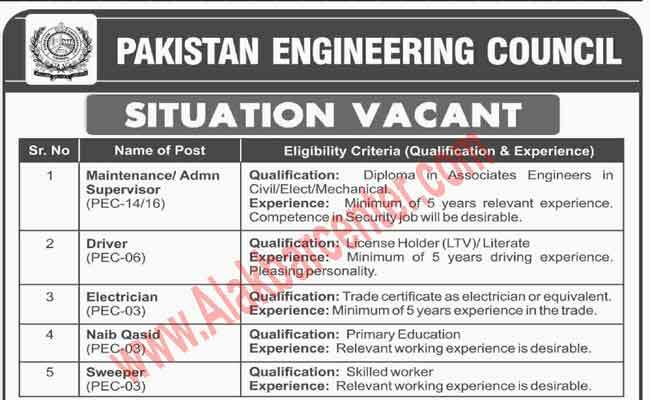 Applications are invited for employment in Pakistan Engineering Council at its Head Quarter Islamabad, Regional Offices and Branch Offices located all over the Country, for the vacancies mentioned below on prescribed form (available at website www.pec.org.pk) along with bio-data, attested copies of certificate/degrees, CNIC, Domicile and latest Photograph. The applications should reach at the address given below up to March 05, 2018 at 1700 hours. Qualification: Diploma in Associates Engineers in Civil/Elect/Mechanical. Experience: Minimum of 5 years relevant experience. Competence in Security job will be desirable. Experience: Minimum of 5 years driving experience. Pleasing personality. Qualification: Trade certificate as electrician or equivalent. Experience: Minimum of 5 years experience in the trade. Experience: Relevant working experience is desirable. Age limit for Sr. No. 1 shall be 55 years and 40 years for Sr. No. 2 to 5. No TA/DA will be admissible for appearing in the interview. PEC reserves the right to reject any or all the applications without assigning any reason. Note: All previous applications submitted earlier for the above post(s) through PEC advertisement dated 01-05-2016 shall be treated as canceled and applicants are advised to apply afresh accordingly.